Even though it’s written up in two prominent guidebooks (Hike #40 in Sullivan’s 100 Hikes in Southern Oregon (3rd Edition) and Hike #30 in Bernstein & Urness’ Hiking Southern Oregon (2014)), this is one of those quirky little hikes that wouldn’t necessarily be on your “must do list.” But it exploits a weakness (more like a failing) in the wilderness designation system that lets a forest road (Forest Road (FR) 870) penetrate deeply into the Rogue-Umpqua Divide Wilderness, which gives you access to big views with minimal hiking effort. So it seemed like a interesting short hike we could do before an approaching weather front reached us. Some driving on reasonably decent gravel roads brought us to Happy Campsite (a pit toilet and two picnic tables) near the end of FR 870. We parked there and walked back down the road about 300 feet to a junction with the Rogue-Umpqua Divide Trail (USFS #1470), a trail of varying quality that runs north-south along the length of the wilderness. That trail took us down into one of the meadows that line the Fish Creek Valley, from where we got our first clear look at Rattlesnake Mountain – the trail to the summit goes up the left ridge. The day started out sunny but would soon cloud over ahead of our first snow storm of the season. Trails through meadows in this area have a tendency to disappear into the vegetation, so some navigation is performed by following large cairns. About 0.7 miles north on the #1470, we came to its unsigned junction with the Whitehorse Meadows Trail (USFS #1477), which took us uphill to Windy Gap on the southern shoulder of Rattlesnake Mountain and to a junction with the Rattlesnake Mountain Way Trail (USFS #1497). 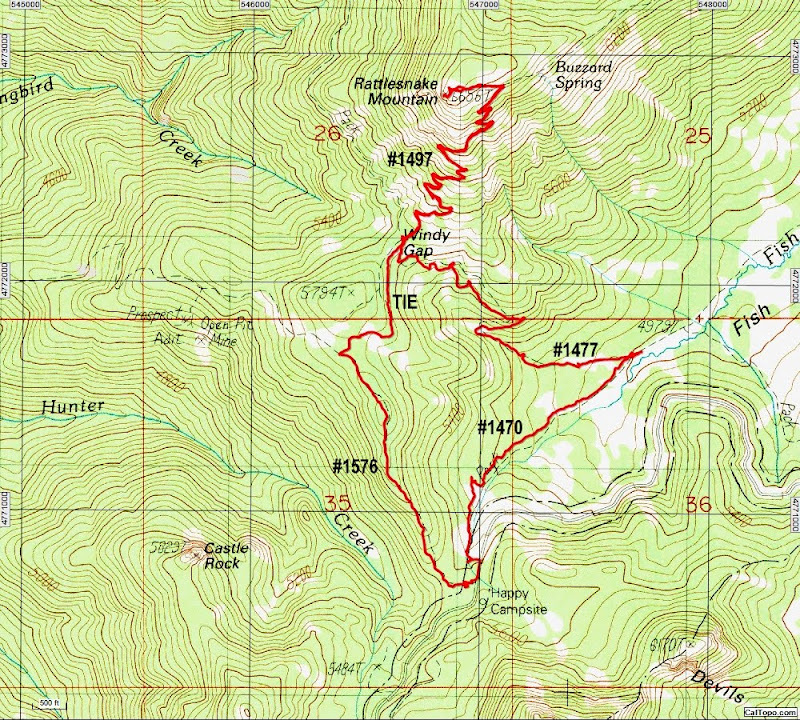 Curiously, the Forest Service map did not show the #1497 reaching Windy Gap. to Rattlesnake’s summit. A 30-foot pole L-4 tower fire lookout was built here in 1933. It had the dubious distinction of being destroyed in the 1962 Columbus Day hurricane. By now high clouds had come in and reduced the sky to a milky, photo-killing overcast. A cold wind had also started but there were still some views to be had. After a cold, hence brief, lunch on the summit, we headed back down the #1477. Once back at Windy Gap, we continued on an un-numbered tie trail to the Castle Creek Trail (USFS #1576) and followed it downhill to Happy Camp. A short, but fun, hike (6 miles round-trip; 1,750 feet of elevation gain) to a nice viewpoint and one that could be combined with another short hike (like Abbott Butte) to make a full day of hiking in this area. We’d suggest doing either on a clear, sunny day for BIG views!